When looking for the best athletic compression socks for men and women, there are a few things you will need to check before you buy. You will need to decide on whether you want to go for a medium compression, which ranges from 15-20 mmHg, or for a firm compression, which is 20-30 mm Hg. 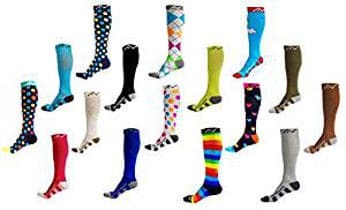 Some compression socks are also available at 20-25 mm Hg which is moderate to firm compression. While some companies recommend a medium compression for athletic compression socks, others make socks with 20-30 mm Hg for this purpose, so it is really up to you to decide what works for you best. 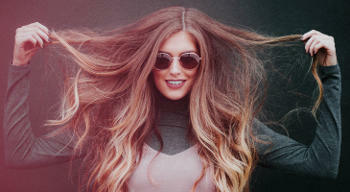 Apart from the level of compression and the right size, you will want to look at the material they are made of. 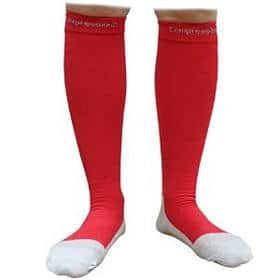 Generally, every company that creates these socks gives a lot of details on their product and its benefits such as stimulating blood flow, reducing leg and foot swelling, relieving pain and a lot of others. In this article, we have selected to review some top rated athletic compression socks, presenting their most important features. 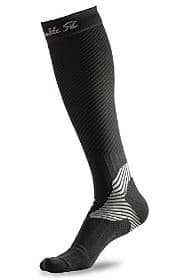 The Compression Socks for Women & Men by A-Swift are just below knee high and come in a vast number of colors and some very attractive looking designs both for men and women. The company provides a detailed size chart, giving men´s and women´s available shoe size as well as calf size so you get a perfect fit. They also offer a free e-book but it´s only good for you if you play tennis or intend to start playing. 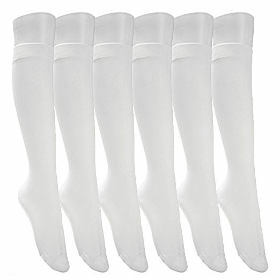 Out of the four main compression levels, these socks are the third highest level of millimeters of mercury (mmHg). They are also made ofanti odor and anti static material which will deodorize and keep your feet dry and comfortable even after a longer use. 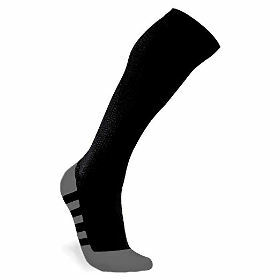 These Compression Socks for Men & Women are extremely popular among the users and get the maximum possible ratings. This is a very good quality product, double stitched with Anti-Bacterial Fabric which will make you feel comfortable as you put them on. They are very easy to get on and off unlike some other compression socks. They wash quite well and you would not feel any loss of compression after the wash. You can also rapidly air dry them within a few hours. The compression is located at the important areas like heel, foot and calves and the toe is comfortable without feeling any squeeze. They are made of quality lycra fabric for a long lasting durability which makes it easy to pull them on without slipping down the legs. I like the design and the color combination at the heel and toe area. It looks very stylish and elegant. 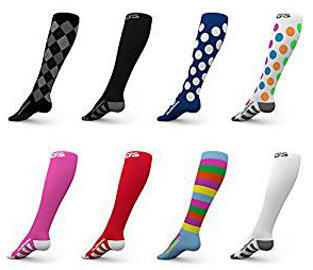 These Compression Socks by CompressionZ come in many fun patterns suitable for both men and women. They are quite colorful and unique looking. The compression is 20-30 mm Hg for better blood circulation. This is strongest at the ankle and it gradually decreases moving up the leg. 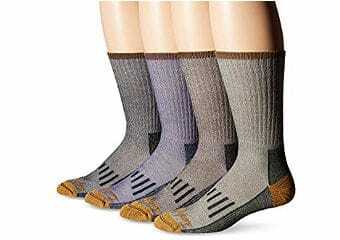 These socks are ideal for all kinds of sports as well as daily wear at home, but they are also suitable for traveling. They are anti odor, anti static as well as breathable for maximum comfort and are made of anti itch material. Also,insulated to keep your feet and leg warm, and they offer great heel and arch support. 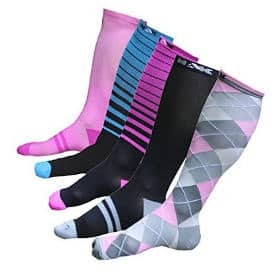 This product gets very high ratings with a lot of satisfied and happy customers who mention that these socks are also good to sleep in and allow good flexibility. 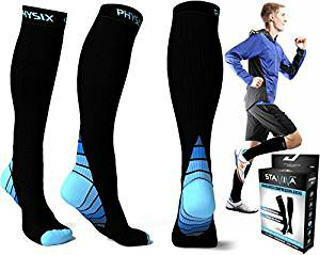 These Graduated Compression Socks are made of high quality and durable materials:65% Polyamide, 20% Elasthan and 15% Lycra while the compression is 16-21 mm Hg graduated from ankle to calf. The colors are also quite nice.The socks are well cushioned and ventilated and the padded footbed will absorb shock while running or playing sports. It also prevents you from getting any blisters and the mesh ventilation will keep your feet dry and cool. These compression socks have a very tight fit and the company recommends that you put them on by turning the inside out except for the toe part, and gradually roll them on. They are designed in Denmark and made in the EU, and pass through extensive testing during and after production to maintain the highest quality control. Available in 20-30mmHgand just below the knee high, these are suitable for men and women. Compression Socks by CompressionZ are best For Running, Athletic Sports, Crossfit and Flight Travel. I am sure that you will like the colors and designs and most users have commented that they look very attractive and comfortable. This product will give you better oxygen circulation which will reduce the lactic acid build up and result in faster muscle recovery. The silver yarn anti bacteria fabric should help to regulate the temperature and keep you warm in winter and cool when it´s hot. There are plenty of sizes available both for men and women. 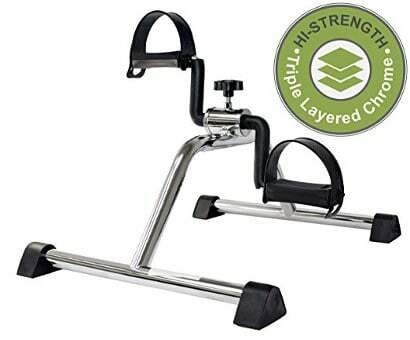 In addition, the user reviews are fantastic and this appears to be another good quality product offered by this company. Graduated Compression Socks For Men and Women – Best for Running, Nurses, Crossfit. The Graduated Compression Socks for men and women are good for athletes and nurses or anyone who is on their feet all day. The company claims that they will help relieve restless leg syndrome and shin splint as well as provide better oxygen circulation. The colors and designs look great to go out for any sporting activity or just to wear at home. The moisture wicking material makes them lightweight and comfortable for running, hiking, traveling and also ideal for nurses as they are on their feet all day. The compression rating is 20-25 mmHG which is moderate to firm compression. 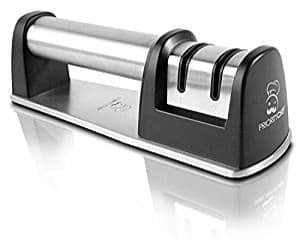 Finally, the product is backed by a 100% satisfaction guarantee and the majority of users´ comments confirm that they are happy with the quality. The X31 Sports Knee High Compression Socks are made of 51% Nylon6/42% Polyester/7% Spandex. The compression rating is 15-20mmHg. They have a padded heel, foot and toe box designed to reduce blisters and lower the impact of long runs typical when marathon training. The moisture wicking microfiber (nylon6) will keep your feet dry and comfortable if you have been on your feet all day or even after long training sessions. It also provides an extra arch support. This reinforced arch support is designed to prevent plantar fascia pain. The colors and the design on the calf look very unique and attractive, and there are only three sizes available, but the company gives you a detailed size chart to refer to before placing the order. 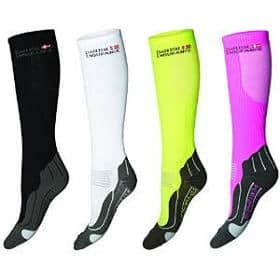 These Compression Socks by FitSocks are only available in neon green color which looks nice and is suitable both for men and women. They are below knee high and good for all sports and traveling. At the moment, they are available at a very good price after the company is offering a good discount. On top of that, they also provide a 100% money back guarantee within 90 days of purchase, so the price and the guarantee makes it a good offer even if you just want to try them out. They are made of compressive knit which is lightweight, breathable and durable microfiber. The heel, middle and forefoot have extra shock-absorbing cushioning for comfort and protection. They are also easy to machine wash and tumble dry. The compression is graduated, starting tightest at the ankles and gradually becoming less towards the knees. The Go2 Compression Socks are of 20–30 mmHg compression rating. They come in a vast variety of colors and designs which make a popular choice of both men and women. The blended nylon fabric infused with silver will ensure to fight odor, bacteria and moisture for maximum comfort. These socks can be worn when you are carrying out different sports activities or even when you are sleeping. They are machine washable, tumble low dry and come with a 100% money back guarantee. The company provides a size chart which you should check before placing any order but a large percentage of users say that they fit as expected. The Compression Socks by Mubasel Gear are available in a compression rating of 20-30 mm Hg. They are suitable for flight, maternity, athletics, Travel and Nurses. In addition, they come in a black and neon green color with a contrasting design around the ankle area. The Nylon and lycra blended material, which the company claims that it will stop the growth of bacteria and fungus, makes them very breathable and keeps your legs and feet at an optimal temperature. They are also anti-odor and anti-itch. 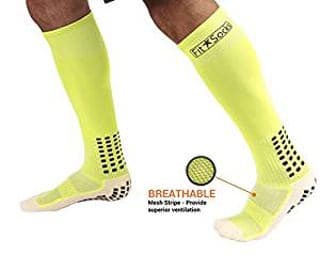 These socks have a strategically placed mesh designed for advanced calf support. For your satisfaction, the company offers a full money back guarantee within 45 days of your purchase. The Wanderlust Air Travel Compression Socks are guaranteed to prevent swelling, pain, edema, & DVT. They are made of Cotton 80%, Polyester 6%, Nylon 9% and Lycra 5%. They have a graduated Compression, 25-30 mm Hg at the Foot & Ankle, 15-20 mm Hg at Middle of the Leg & Calf and 10-15 mm Hg under the knee which is an ideal amount of compression needed to provide good support. Manufactured with an advanced technology for maximum comfort, they also have a seamless toe box which will prevent blisters and reduce friction. The foot padding is very soft and the arch and heel support relieves plantar fasciitis. They are very easy to get on and off, the legs cuffs are adjustable to match your height and the socks will not roll down the legs. The company gives you a full money back guarantee or sends you a new pair for free. 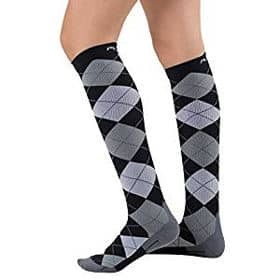 The Argyle Compression Socks are made of 80% Nylon and 20% Spandex. They are made of very soft material which fits comfortably against the skin. 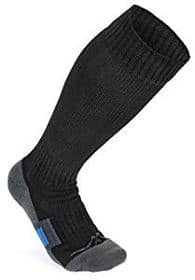 The compression in these socks ensures that they will not slip in your shoes or slide down the legs and it is graduated, being highest on the ankle area and least in the calf area. The material used is breathable, lightweight and moisture wicking that will keep your feet free of perspiration even in warmer days. They are also anti-odor, preventing the buildup of any smell. This product is accompanied by a 100% satisfaction guarantee and the company states that if at any point this product doesn´t live up to the buyers´ expectations, they should simply email the company to receive either a refund or a replacement. The EagleUS compression socks are made of copper infused fiber which reduces swelling and pain. The material content is 84% Nylon, 10% CuTEC Copper Nylon and 6% Lycra Spandex. They are only available in black with a cute and unique looking design on the foot which looks like you are wearing a sandal. 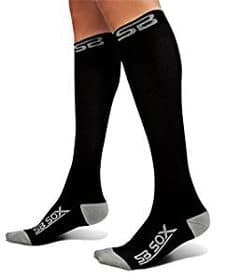 These Compression Socks by SB SOX are only available in black and attract very high ratings from the consumers. At the time of writing this review, the company is offering a huge discount making it a very low price product. They also offer a 100% money back guarantee if it doesn´t meet your expectations. Made of anti-odor and anti-static moisture wicking fabric, it will keep the sweat away from your feet. The heel and the toe are reinforced and the arch support can reduce plantar fasciitis. 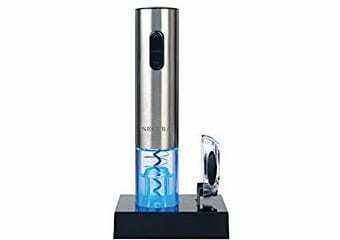 The users are extremely happy with this product, saying that it is better quality than expected. These Sports Compression Socks have a medical Grade Graduated compression of 20-30 mm Hg which will boost circulation and oxygen delivery to the muscles. They are made of anti odor, anti bacterial high grade nylon and spandex to eliminate bacteria, fungus and odor. They come in 4 colors with a small price difference between the black and the other colors. This product is heavily discounted for the moment, and I´m not sure how long this discount offer will last. It also comes with a 100% satisfaction guarantee and the company will refund your money or send you a replacement. Keeping this offer and the price in mind, it makes it a good deal. These Graduated athletic Compression Socks by PeakPlus are good for running, nurses, sports, recovery, and travel. 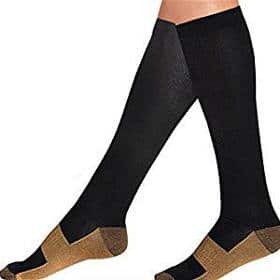 They have a medical grade graduated compression of 15-20mmHg and are made of durable, breathable nylon and lycra spandex fabric which is anti-odor and anti-bacterial. 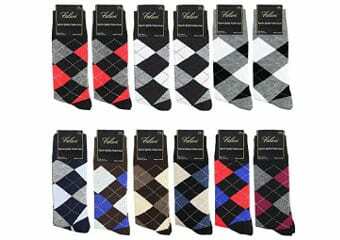 These socks only requires simple maintenance of machine wash and normal tumble dry. They also come with a protective padding around the toes, heels and balls of the feet which is moisture wicking to reduce blisters, chafing and skin irritation. The sizes available are Large/X-Large (Men’s Shoe Size 10 – 13; Women’s Shoe Size 10 – 14.5). 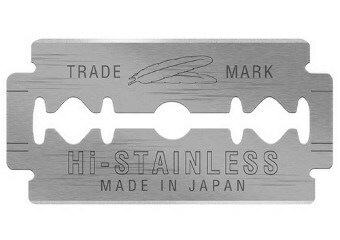 This product comes with a guarantee from the company if you are not happy with it for any reason. These Graduated Sports Compression Socks by J-Trendy have a compression of 15-20mmHg.The material used is 35% nylon, 35% polyester and 30% elastane. The wicking and quick drying fibers can prevent the growth of bacteria and fungus effectively while there is also an extra support for the ankle as well as heel. Sold in a pack of 6, you have the choice of either going for the same color in a pack or for assorted colors. The sizes are S/M ( men 5-9 women: 5-10), L/XL ( men 10-13 women 11-15.5). They are sent to you in a nice gift box so they can make a great gift for the holiday season or any other occasion. 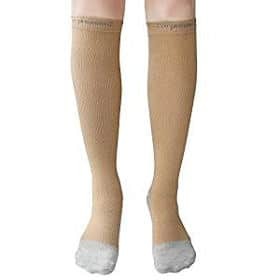 These compression socks by CompressionZ are quite popular among both men and women, particularly for nurses. 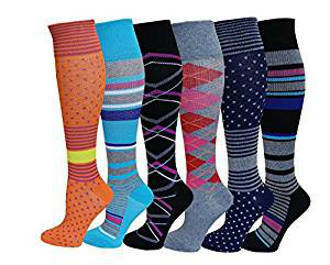 They are below knee high and are available in a variety of different nice colors and patterns that both men and women will find easy to choose from. The graduated compression of 20-30mmHg provides for a better blood circulation and a faster muscle recovery. They are made of silver yarn anti bacterial fabric that regulates the temperature, making you feel warm when you are cold and cool when you are hot. Moreover, the fabric is anti static and anti odor which makes it ideal for sports, travelling or daily wear. 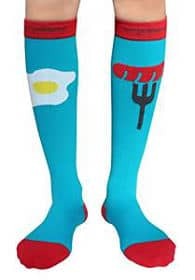 Designed in the USA, these Graduated compression socks by are knee high, non binding and they look pretty cute. They come in a pack of different colors and patterns so you will not easily get bored of wearing them. The moderate (15-20mmHgg) compression boosts circulation and relieves fatigued or painful legs and feet. Moreover, this product is good for minimizing swelling and energizing your legs. The smooth seamless toe offers a comfort fit. Users say that these socks are comfortable, tight enough to reduce swelling and don´t droop to the ankles after wearing them for a long time. 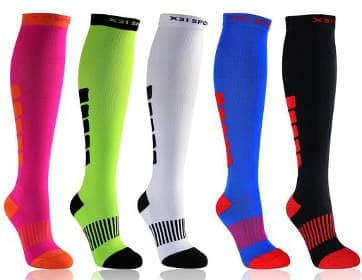 Finding the best athletic compression socks for men and women is not difficult after all when you see that there is a wide variety of good quality socks available in different colors and designs to suit your taste and make your activities a lot easier and less painful.